Dreaming of living off-the-grid and realizing the dream of building your own tiny house? Here’s everything you need to know about building an off-the-grid tiny house quickly and affordably! Beginning in Winter of 2013, my husband Brian and I began the process of building an off the grid tiny house on our homestead, from scratch. While the infrastructure creation process is far from over (we still are living without running water), I wanted to put all of our posts about building a tiny house in one place, so anyone interested in small-scale construction could follow our process from beginning to end. We initially intended to build a tiny house that would transition into a guest space or office, but once we completed our 350 square foot home we realized that a) we did not have the funds or energy to immediately launch into another building process (our kids were 2 and 5 when we began and parenting was extremely hands-on! ), and b) we LOVED our tiny house and wanted to live in it ourselves! 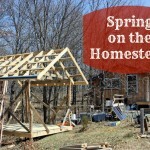 We also had an array of homesteading projects that we wanted to dive into – projects like building a homestead root cellar and building an outdoor pizza oven. And of course installing a solar electric system. We also have access to an enormous resource: Amish-owned mills that offer durable white oak lumber for a fraction of what you might pay at Home Depot. My husband is an extremely skilled guy, with years of carpentry experience. 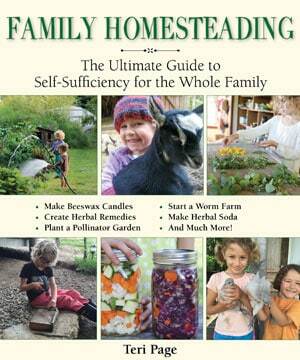 We came into this project with over a decade of homesteading experience and with lots of hard skills. Each of these factors dramatically affected our ability to build an off the grid tiny house quickly and affordably. To get started, let’s look at some of the basics: Why building a tiny house might be a good idea for your homestead, and what it’s really like to live in a tiny house. In our case, we have four people sharing a 350 square foot home. My husband and I both have home-based businesses and we homeschool our two children. So we interact together in our space a lot. It is not always easy, but it has led to incredible closeness in our family, which is one of the greatest rewards I could imagine. We broke ground in February of 2013 (we had a mild winter) and continued working on our off-the-grid tiny house throughout the summer of 2013. By November 2013, we were able to move into an insulated, but unfinished home. 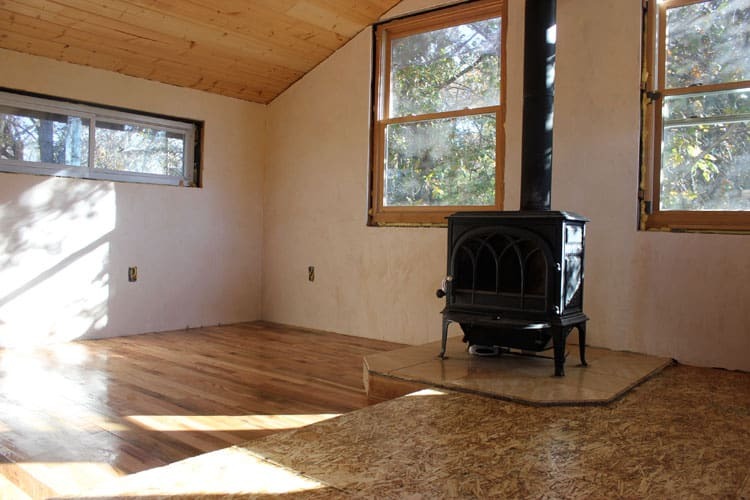 We had a woodstove, sub-flooring, and very basic shelving for books and kitchen items. Breaking Ground – Holes in the ground have never been so exciting! Early photos of the framing process – Our home is essentially a pole barn, with 9 oak posts and no foundation. It is not on a trailer like most tiny houses tend to be. We did not anticipate ever moving our home, nor did we have the constraints of zoning or residential codes. Building a Tiny House – Some detailed photos of the framing and flooring, including our floor insulation. If you feel excited to scroll back through the archives, most of the posts from April and May 2013 detail our camping-on-the-land preparation, including setting up an outdoor kitchen, camping in a tent (and then a pop-up tent trailer, and then a tent again), and setting up water catchment systems. Framing Doors and Windows – In which progress is really made!! We built our home with a blend of new and reclaimed materials, many of which you can see in this post. Little Details – Because building your own off-the-grid tiny home is really all about the details! Some of which take shape only as you build. We made many changes along the way, and the end result is a house that truly fits our needs. Siding and Tiling – Probably our biggest “score” of reclaimed material was beautiful barn wood from a deconstructed barn. Insulation – We used blown cellulose insulation for the walls and ceiling of our house. This process was fun and messy. Wall Plaster – We learned some simple plastering techniques from two good friends that specialize in the process, and coated our walls with a gypsum plaster that was mixed with natural pigments. The results are truly gorgeous. Homestead Pantry – This may be my absolute most favorite part of our off-the-grid tiny house – a built-in wall pantry whose shelves were built to fit quart and gallon sized mason jars perfectly! 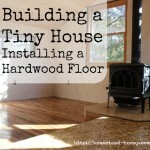 Flooring – We really lucked out on a lot of oak flooring from an Amish auction. Sanded and coated, it helped turn our house into a home. 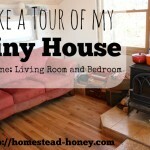 Tiny House Tour – Alas, I have only recorded part one of the homestead tour, and still need to take footage of our kitchen and dining nook (we built in a four person booth seating area into the area directly across from the pantry). But you should be able to get a good sense of how we use shelving to divide living spaces, and how our woodstove hearth acts as the focal point of our off-the-grid tiny house. 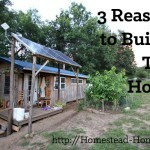 I will continue to add to this list of resources as new posts about building an off the grid tiny house get written. 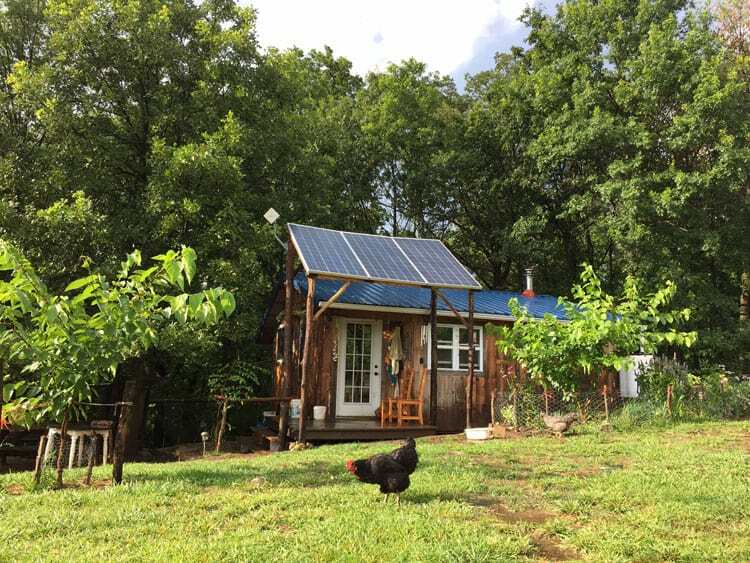 Also, if you are interested in learning more about the creation of our off the grid homestead, from the big things like how to select, install, and live with solar electricity, and water catchment (even in winter! 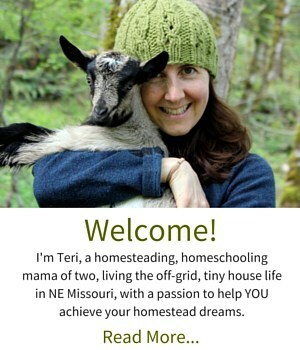 ), to the little details like how to do laundry off the grid, or what it’s really like to have livestock and take care of children while living off the grid, I encourage you to check out my eBook, Creating Your Off-Grid Homestead. You can purchase it individually, or part of an Off Grid Bundle (which comes with a built in 15% discount!). And as always, I welcome your comments and questions and will do my best to answer them myself, or I’ll consult with the real brains behind our homestead building – my husband Brian. Want to know more about the legalities of building a tiny house in the US? Check out this article. 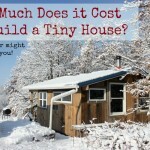 For a Tiny Homes 101 for Canada, I recommend this article.